A dark secret connects them..
Cameron Dawson is trying to get to grips with his tragic past by coming home to Faith, New Mexico. He has taken the job of assistant Sheriff in the sleepy, quiet little town and his life seems to be settling into a peaceful routine. Until, that is, a sequence of gruesome and baffling murders strike the usually crime free town. Cameron can’t comprehend what is happening to people he has known for most of his life. Dr Kyle Bancroft, miles away from Faith, is being bombarded with flashbacks, dreams of terrible occurrences, and paranormal experiences. A ghostly child is appearing to Kyle with a pressing and crucial message. Kyle has five days to stop something horrific happening. She can’t evade the feeling of dread and her chilling premonitions and perceptions are drawing her to Faith although she no idea why. She can only hope to be taken seriously and offer what help she can. Cameron has never before been witness to events such as he now finds himself having to face. The suspects couldn’t be more unlikely, and there are several of them. As the evidence mounts up it takes an appalling direction. There’s no logic he can apply, no way to can rationalise events so he goes with a quote from Sherlock Holmes…when you have eliminated all which is impossible, then whatever remains, however improbable, must be the truth.’ Trusting Kyle’s psychic visions is his last hope. Something in the air seemed to change. Something sudden, mysterious, and filled with bad intent. Wind-driven clouds gaining momentum, swirling into the path of a fiery moon. What once was settled began to stir. Where there had been order, there was unrest, and from the gathering darkness, new life emerged. The sort born of pure evil. A very fast-moving and multi layered storyline with high level suspense and, be warned if you’re squeamish, a very graphic, gruesome and, obviously very well researched given the attention to detail, forensic aspect in the first part of the book. Short and intensely descriptive chapters, some ending on mini cliff hangers, relentlessly draw you in. The central figures are strong and compelling. Listening to the audio adds an extra dimension to their portrayal. Cameron especially, during his recollection of the heartbreaking events that changed his life. Luke Daniels puts a huge amount of emotion into his narration and so gives the characters that extra authenticity. The only thing that didn’t quite gel for me was the relationship between Cameron (although he absolutely deserves some happiness after what he’s been through) and Kyle, but nevertheless it was a fantastic listen. And the ending had the tears flowing. Andrew was named one of the highest-grossing independent authors in the country when his total number of books sold pushed well past the six-figure mark. His recent release, The Lion, the Lamb, the Hunted: A Psychological Thriller was on Amazon’s Top 100 for more than one hundred days. It became their seventh bestselling title out of more than one million e-books available nationwide and number one in its genre. 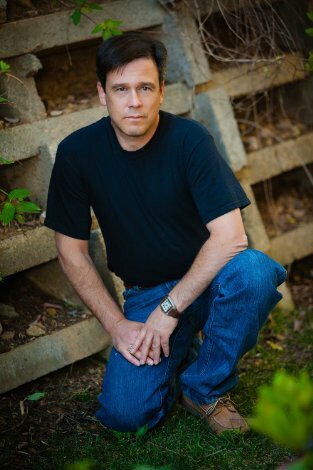 His first novel, While the Savage Sleeps, made the Top 100 as well and was number one in its genre, passing up two of Stephen King’s current releases at the time. Both books are bestsellers in the UK and Germany, and both books were simultaneously number one in their genres in the U.S.
His success resulted in signing an international dual publishing deal with Thomas & Mercer and 47North. His newest work, Darkness & Shadows, an intense psychosexual thriller, was released in 2013.